Is humor part of your brand’s personality? Do you wonder if it should be? When humor fits with your brand’s online identity, it can be a powerful social media tool. In this article I’ll show you examples of three ways you can use humor to grab attention. Humor is an excellent addition to your social media toolbox. It makes your brand memorable, invites conversation and improves shares, likes or retweets. If you want to use humor as a social media marketing tactic, you’ll find good examples later in this article, but first let’s talk about the importance of defining your online voice (or tone). Humor relies on having the right tone. Which two elements fit best with your brand’s voice? I first heard about the tone of voice triangle from Bruce Daisley. He explained that each point of the triangle represents an aspect of your brand’s tone: Fun, Help and Give Info. To define your social media personality, choose the two elements that best reflect your brand’s tone. You don’t have to eliminate the third element, but the two strongest ones should direct your online personality. 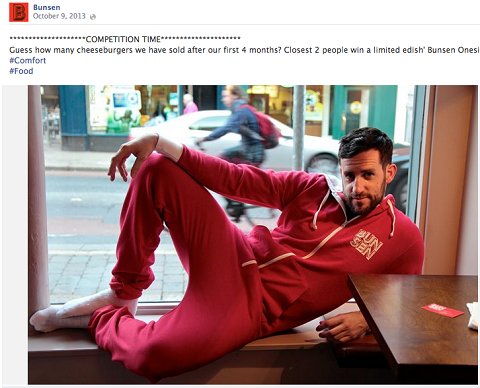 As an example of how tone affects humor, let’s look at Bunsen Burger, a gourmet burger restaurant in Dublin. They’re known for their sparse menu and the care and attention they put into creating their delicious burgers. It’s a popular spot for hipsters and most nights there’s a long line to get in. 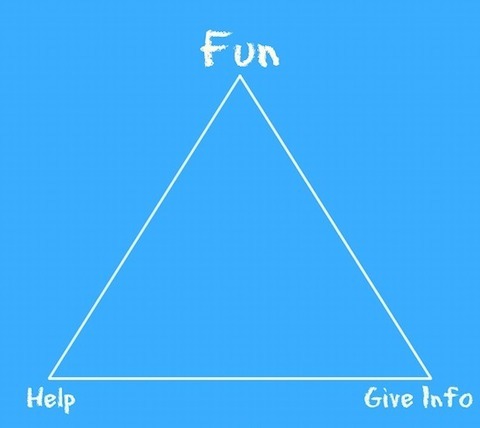 If we apply the tone of voice triangle to their business, Fun and Give Info are their strong points. Those two elements (especially Fun) are reflected in their Facebook updates. Bunsen Burger using humor to show off their personality. The picture below is an example of how their Facebook page is bursting with humor. It’s a perfect fit for their audience. Before you start injecting jokes into your own social media marketing, take the time to make sure everything fits together. Ask yourself how your offline and online identities work together. Does humor fit with both? How do your customers, fans and followers view you? Do they think of you as cheeky, friendly or edgy—or reserved and conventional? Some businesses may be more suited to humor than others. Depending on your strongest triangle elements and your answers to the questions above, you may find that humor doesn’t fit your goals or audience. 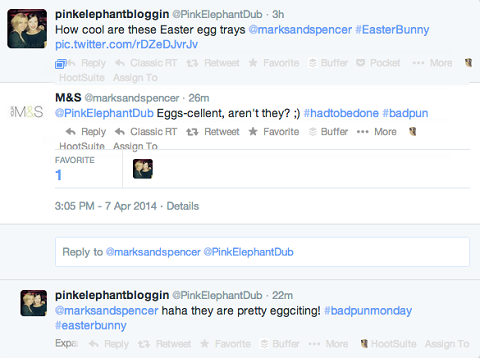 Mark & Spencer’s gentle humor is the sort of humor your mother would be comfortable with. That’s the case for Mark & Spencer, a department store renowned in Britain and Ireland as a quality brand. If they were to use the tone of voice triangle, their best matches would be Help and Give Info. Their established voice is very conventional and is so strongly ingrained in its audience that humor doesn’t fit (although they can get away with the occasional bad pun). If you’ve decided that humor is a good fit for your brand, keep reading. Below you’ll find three ways you can attract attention with amusing updates. A sense of humor can go a long way when you’re talking to customers online. Of course you have to take customer queries and complaints seriously, but there are times when you can add a bit of levity. In a recent Twitter campaign, mobile phone carrier ThreeUK asked people to tweet them a word. If the tweeter’s word was chosen, the ThreeUK choir would sing it to them. People tweeted all kinds of words and ThreeUK responded to all of them with fun and a smile. Their followers loved the interaction—and the final video! ThreeUK had a funny take on even the most bizarre suggestions. Mick’s Garage in Dublin is another example of a company that includes humor in their customer responses. 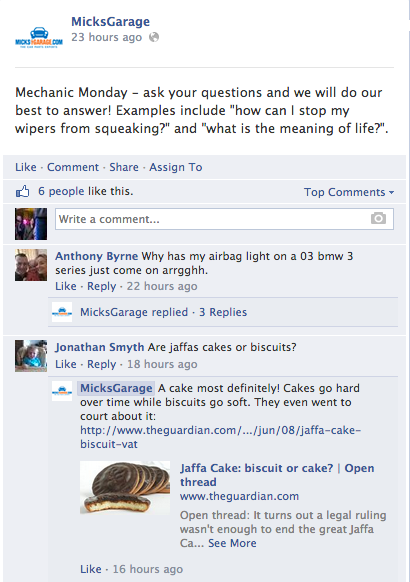 Mick’s Garage answers questions about everything from air bags to Jaffa Cakes. Every Monday, they invite their Facebook audience to ask their mechanics questions. The casual tone of the updates brings in a mixture of both jokes and serious responses. A funny story grabs attention and stays in the minds of your audience, even when the humor is understated. Back in 2010, one of my favorite Facebook pages, Hairy Baby, shared a great story about Seamus, a bird that got stuck in their factory. Seamus was only there a few days, but the company posted a series of updates that have stuck in my mind ever since. In this picture you can see that Hairy Baby took this adventure very seriously. The story of Seamus—his first night in captivity. All of the posts on Hairy Baby’s page are family-friendly and fun. They’ll make you laugh out loud from time to time too. Zwartbles Ireland also tells a really good tale. They raise a rare breed of sheep and sell the wool and blankets made from that wool. The company has given each sheep—and the Cat Shepherd who corrals them—a personality. 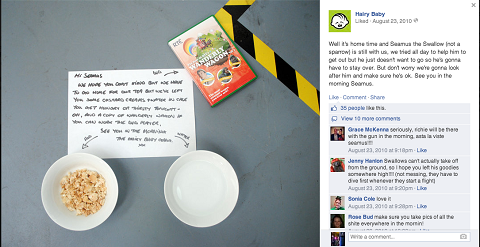 The animals’ day-to-day antics are a central part of the company’s online marketing. Fans follow them on Facebook for regular updates. 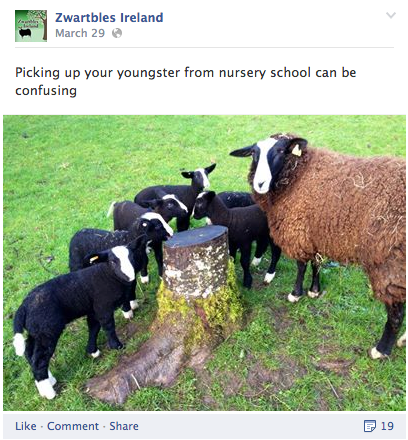 Zwartbles Ireland shares clever captions and photos of their sheep being sheep. 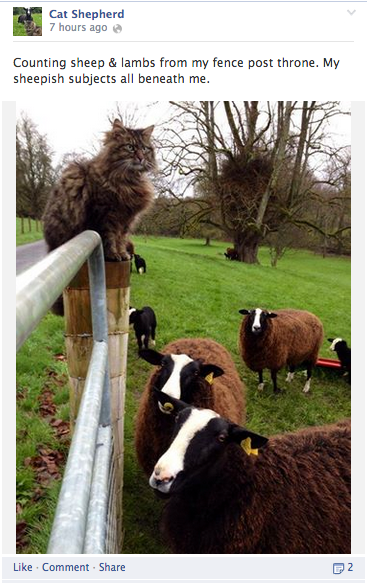 The sheep’s cohort, the Cat Shepherd, has become so popular he got his own spin-off page! Not to be outdone, the Cat Shepherd earned his own Facebook page. These day-to-day updates aren’t laugh-out-loud funny, but like Hairy Baby’s updates, they’re cute, family-friendly and endearing. Use humor in your storytelling and you’ll ensure not only that people remember your brand, but also that they’ll smile when they do so. Pushing the boundaries of humor can be an amazing boost for your profile or it can be wildly unsuccessful and do more harm than good. Do you remember the JC Penney tweets from the Super Bowl? 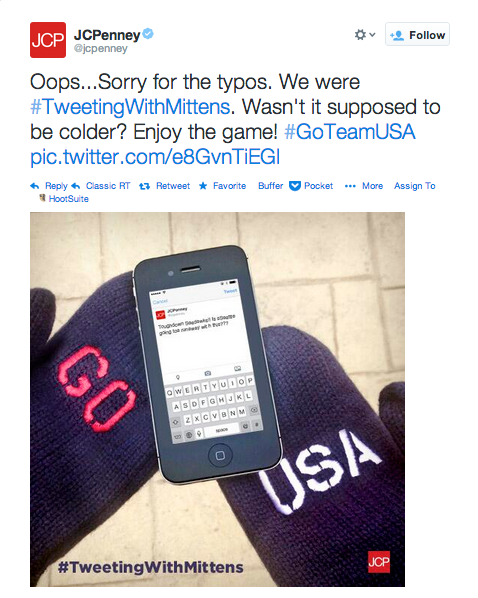 Until they revealed the punch line—that they were tweeting while wearing mittens—more than a few people assumed they were drinking and tweeting. The big reveal: We’re wearing mittens! Some companies are more comfortable stepping over the boundaries of good taste than others. It’s a calculated risk, but if your audience is game, you could win big. Using humor will help you be memorable, make it easier to connect with your community and help you define your personality. Each social channel has a different tone. As with all marketing campaigns, the key to success is to know your audience and what’s appropriate for your brand and the networks you’re using. My examples are mostly from Facebook and Twitter, as these are places where users expect entertainment, but go ahead and try out other social channels as well. Instagram is a good choice for sharing funny in-the-moment pictures, but tread carefully if you’re sharing on a more professional website like LinkedIn. What do you think? Have you used humor as a social media tactic? How did your audience respond? I’d love to hear your thoughts. Amanda Webb from Spiderworking works with SME’s helping them improve their social media strategies. She is also co-founder of Blog Awards Ireland and social media training company We Teach Social.